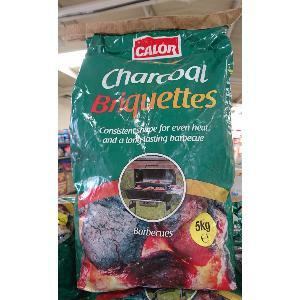 Calor Gas Charcoal Briquettes have a consistant shape for and even heat and long lasting barbecue. 1. Make sure that the barbecue vents are open and the pan is clear of old charcoal. 2. Arrange the briquettes in the centre in a small pile. 3. If using lighter fluid cover the briquettes in the fluid and wait for a few minutes for it to be absorbed. If using fire lighter cubes, please place a few cubes in with the briquettes. 4. Keep hands clear, set light to the pile. 5. Wait until charcoal turns white then spread out to give an even heat using an appropriate metal accessory.